Howies Instorematic session with Henry, originally uploaded by moleitau. Time for an update. The siege mentality has set in, and incremental progress is being made towards The Glorious Completion. hello. pedal faster., originally uploaded by judith. Some crazed automatic writing/drawing I did one lunchtime on a paper tablecloth in San Francisco during the ISEA interactive cities summit. Went to the Design London STIR Lecture by Peter Molyneux this evening, and came away disappointed. Actually, I didn’t have very high hopes in the first place, as I’ve seen Molyneux before, and although he’s certainly passionate, found his charm ran out pretty quickly – but worse, he had little insight to offer. But the over-riding thought I kept having was that he didn’t have the critical language to describe what he (or more correctly, his teams) had created. He isn’t nearly as literate in why his own games work as the current generation playing his games. Based on events like EIGF, this seems to be the case, at least amongst Molyneux’s generation of industry veterans. Bedroom-programmers-done-good, pioneers to be sure, but not able to form a critical appreciation of what they are doing or have done beyond the commercial impact. This is something that reoccurs with every new medium, of course. The next generation on from them – e.g. Jonathan Smith, Doug Church and of course Greg Costikyan (from whose classic essay on developing such a critical language the title of this post is lifted) are always eloquent, passionate and insightful speakers and spokespeople for their medium. what did people enjoy? the graphics were not good, the sound effects were awful, and the game play was repetitive: people believed there was more in the game than there was. people got obsessed by the “AI” but it is ‘soft, simulational AI, not real AI’ – a sufficently-complex feedback system is seen as an AI. again people believed there was more in the game (theme park) than there really was. the creature was prototyped to have desires, which could be satisfied by actions… creates a ‘real’ illusion of mind. Internal needs, wants, motivations – first one we gave the creature was to satisfy it’s hunger. 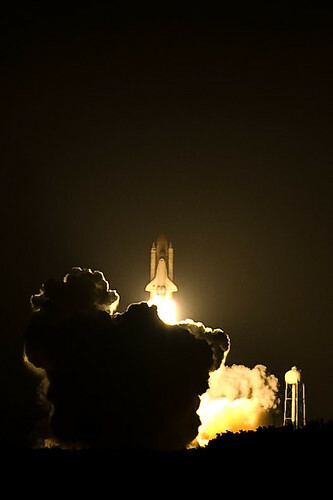 Space Shuttle STS-126 Launch, originally uploaded by hyku. The picture is by Josh Hallett who I had a great time speaking with in the same session on social media at the Sarasota Design Summit in Florida recently. After I said I was planning to visit NASA while in Florida, he told me he was going to be attending the night launch of STS-126. I got to see STS-126 on the pad at fairly close-quarters (well, a couple of miles) but he got this shot, which I think you’ll agree is fairly magnificent. I can’t quite believe we can count the number of times we’ll see this again on our fingers. Wikidashboard‘s a fantastic project from Parc, which I found today via Waxy. It displays and visualises the change history of an article in-situ. As Waxy says it would be great to have a greasemonkey script which placed this information on the pages of wikipedia proper. Except – it’s too much for me. I want it to be glanceable-not-pore-over-able at this level, just giving me a swift indication of the volatility of the entry. In early 2005, I proposed tiny sparklines based on the HistoryFlow visualisation project that could be seen in-situ to give a very quick feel of the change history of an article. Who Stole My Volcano? 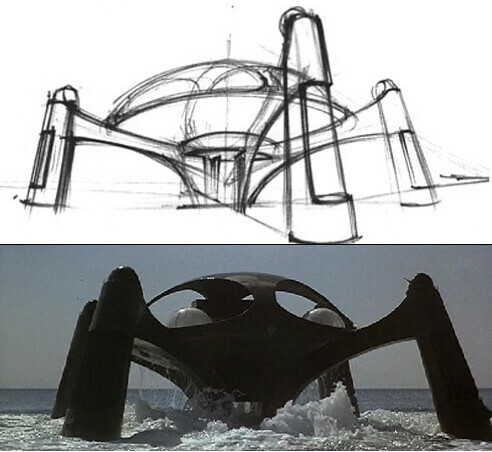 Or: How I Learned to Stop Worrying and Love the Dematerialisation of Supervillain Architecture. I saw Sir Ken Adam, production designer of numerous Bonds, Chitty-Chitty-Bang-Bang and Dr. Strangelove amongst other movies, interviewed by Christopher Frayling at the V&A last Friday, as part of their current Cold War Modern exhibit. As a result, Frayling concentrated the conversation on those iconic Cold War images of the war room in Dr. Strangelove, and the numerous lairs for Bond Villains he had designed. Frayling described these lairs with a lovely turn of phrase, paraphrasing Corbusier’s “houses are machines for living in” – that they were “Machines for being a meglomaniac in”. Adam responded that his intention was to make the Bond Villain a contemporary creature. They should embedded in the material culture of the times – albeit with the resources of a meglomaniac millionaire or billionaire – and also able to reach a little bit beyond into a near-future as those resources allow. Although rather than maintaining a purely high-modernist aesthetic, Adam’s villains were ostentatious, status-seeking magpies, with their old masters from a daring heist, siberian tiger rugs and priceless antiques on display next to their Eames recliners and Open-plan freestanding fireplaces. “Gantries and Baroque” might be the best name for the look though, as this finery was, of course, all inside the ‘sanctum-sanctorum’ of their lair – generally they would have maintained such a well-appointed apartment somewhere within a more massive and industrial death-dealing facility staffed by uniformed private armies. Frayling pointed out this repeating formula in the 60s and 70s Bond movies to the audience. A hidden fortress, that had to be discovered, infiltrated and destroyed with a girl/goddess as guide – but not to be destroyed before we could take in some of the fine lifestyle touches that supervillainy gave as rewards. But then in an almost throw-away aside to Adam, he reflected that the modern Bond villain (and he might have added, villains in pop culture in general) is placeless, ubiquitous, mobile. His hidden fortress is in the network, represented only by a briefcase, or perhaps even just a mobile phone. Where’s the fun in that for a production designer? Maybe it’s in the objects. It’s not the pictures that got small, but the places our villains draw they powers from. 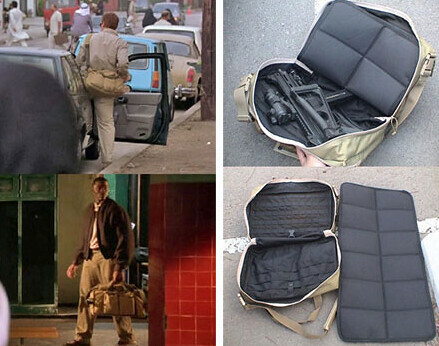 Perhaps the architypical transformation from gigantic static lair to mobile, compact “UbiLair” is in the film Spartan, where Val Kilmer’s anti-heroic ronin carries everything he needs in his “go-bag” – including a padded shooting mat that unfolds from it to turn any place into a place where he holds the advantage. Move beyond film and I immediately think of my favourite supervillain of the year, Ezekiel ‘Zeke’ Stane from Matt Fraction‘s masterful run on the comicbook Invincible Iron Man. Zeke is a post-national business man and kind of an open source ideological terrorist, he has absolutely no loyalty to any sort of law, creed, or credo. He doesn’t want to beat Tony Stark, he wants to make him obsolete. Windows wants to be on every computer desktop in the world, but Linux and Stane want to destroy the desktop. He’s the open source to Stark’s closed source oppressiveness. He has no headquarters, no base, and no bank account. He’s a true ghost in the machine; completely off the grid, flexible, and mobile. That absolutely flies in the face of Tony’s received business wisdom and in the way business is done. There are banks and lawyers and you have facilities and testing. Stane is a much more different animal. He’s a much smarter, more mobile and much quicker to respond and evolve futurist. I was trying to figure out what a new Iron Man would look like, and I figured, well, there wouldn’t be a suit anymore. The user would be the suit. I just started to riff on that, on cybernetics and riffing on weaponized bodymod culture stuff. Tony’s old money, old world, old school and old model manufacture. So where would Stane, a guy that had no manufacturing base and no assembly facilities, get his tech? Everything would need power sources, so how would that work? Where would the surgeries be performed? How would he pay for it? What’s his ideology? I started reading up on 4G war and warfare. And on and on until I understood Stane’s reality, and how Stane would wage war on Stark Industries and Tony both. So – for a “4th generation warfare” supervillain there aren’t even objects for the production designer to create and imbue with personality. The effects and the consequences can be illustrated by the storytelling, but the network and the intent can’t be foreshadowed by environments and objects in the impressionist way that Adam employed to support character and storytelling. 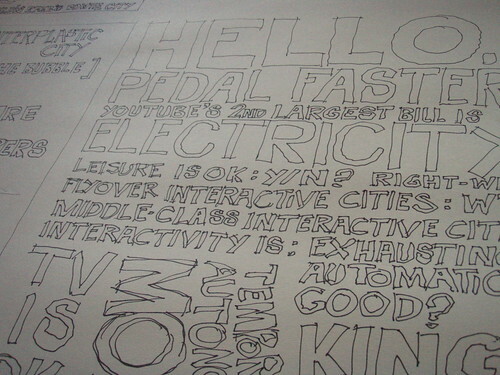 But – what about materialising, visualising these invisible networks in order to do so? Dan Hill just published a spectacular study of his – into the ‘architecture’ of wifi in a public space. They make visible the invisible flows of the network around tangible architecture, and the effect that has on how people inhabit that tangible space. Me, I just think that’s what’s fluxing and flexing around the 4th Gen Bond Villain. That’s what could telegraph to us, the audience their bad intentions. That’s what communicates their preference, and their potency. Could it do it as effectively, immediately, seductively as Sir Ken could with Cor-Ten and Cashmere? In the mean-time, in the real world of all-controlling superpowers, we seem to be coming full circle, architecture professor Jeffrey Huang has been investigating the all-too-tangible architecture of what we rather-wishfully call the cloud: server farms. These hydropowered, energy-guzzelling megastructures seem to have all the ‘Gantry’ but not a lot of ‘Baroque’ panache to qualify as good old-fashioned Bond Villain SuperLairs. This summer, Google put a patent on floating data centers cooled and powered by the ocean. Sir Ken was always ahead of his time.